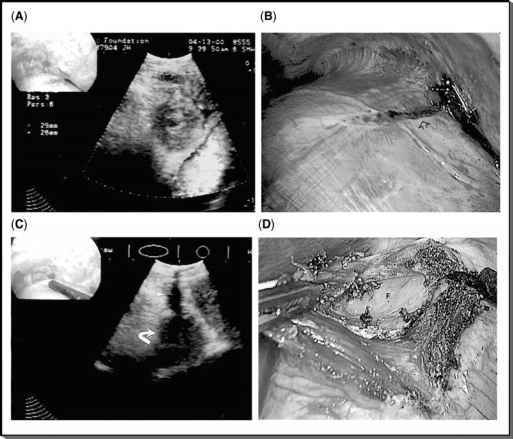 FIGURE5 ■ Intraoperative ultrasound. (See text for details.) Source: From Ref. 16. 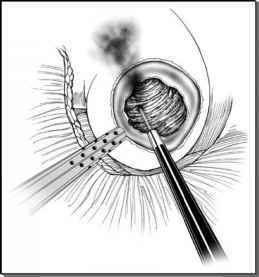 The diaphragm is suture repaired in an airtight manner with a running locking 2-0 polyglactin suture on a computed tomography-1 needle with freehand laparoscopic suturing and intracorpo-real knot tying techniques. by continuing the dissection caudal, and clipping and dividing multiple adrenal branches arising from the renal hilum. On the left side, the longer, obliquely oriented left main adrenal vein is identified along the inferior-medial aspect of the adrenal gland. After the left main adrenal vein is secured with an Endo-GIA stapler, the adrenal gland is completely freed and is retrieved into the thoracic cavity. The specimen is then entrapped in an Endo Catch bag, and extracted intact through a port site. After confirming hemostasis, the adrenal bed may be filled with a thrombin soaked absorbable hemostatic agent.